Saint Pimen the Fool-for-Christ and Anton Meskhi (of Meskheti, in southern Georgia) lived in the 13th century, when the Mongols were regularly invading Georgia. The entire country, and the Church in particular, languished under the yoke of Mongol oppression. The Georgian people were once again faced with a terrible choice: to preserve their temporal flesh or attain spiritual salvation. Most would not yield to the temptation of the enemy and chose instead to die as martyrs for Christ. At that time a monk named Pimen, a fool-for-Christ, labored in the Davit-Gareji Wilderness. His ancestral roots were in the Kakheti region of eastern Georgia. Pimen rebuked kings and condemned the unjust and immoral acts of the nobility. The pious monk Anton Meskhi labored with him. 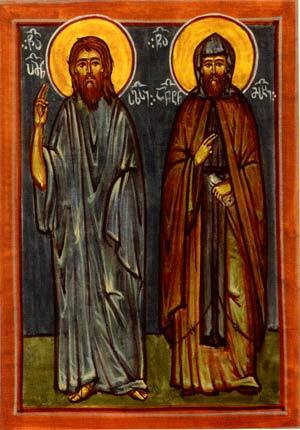 For their great spiritual achievements and struggles on behalf of godly purity, the Christian Faith, and the spread of the Gospel among the Dagestanis, the Georgian Church has counted Pimen the Fool-for-Christ and Anton Meskhi worthy to be numbered among the saints.